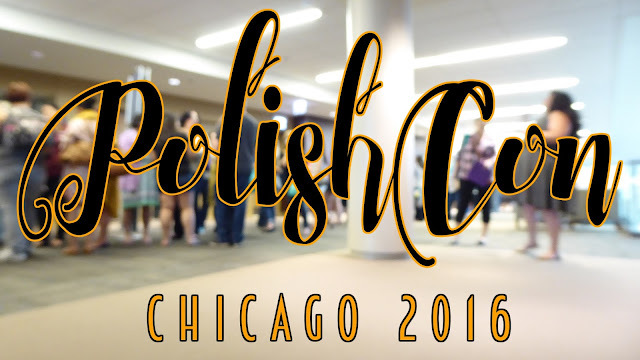 This Fall, I took a trip to the midwest and visited the first ever Polish Convention. It was a huge collection of indie brands, bloggers, fans, and artists all drawn into one tiny humid spot. Good times were had, and I can't wait for next year. 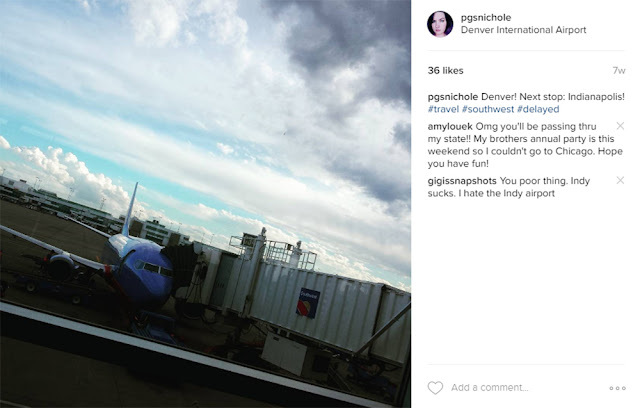 I flew from my home state of California to Indianapolis, Indiana. It was a long day, ya'll. Southwest Airlines is affordable, but holycow are they plagued with delays. I drove from Indy to Chicago with a friend, and we met another friend once we got there, and we all crashed at a nice hotel outside the city. 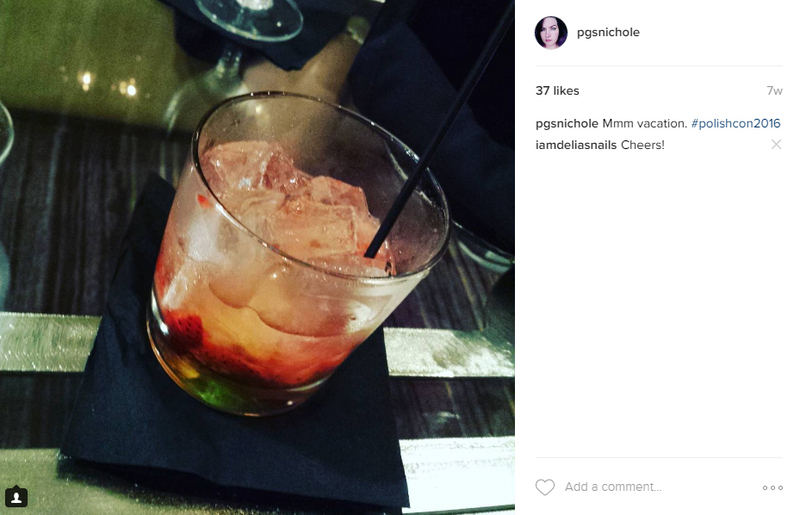 We had dinner and drinks in the hotel bar. Good times were had. I don't get out much these days, and it was a brilliant breath of fresh air. 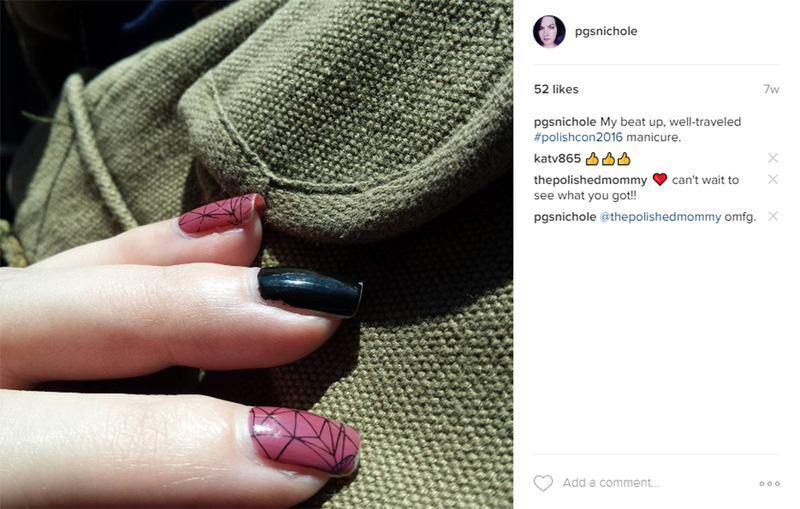 And of course, I did something special to my nails...and I didn't remember to take a picture until the day after. I used a new shade from B Polished plus some China Glaze. I wanted to stay simple, since I was going to be gone for five days at least. It survived the trip mostly intact. I snapped a quick picture during a snack break. During the actual "con/shopping" time definitely stopped. It was very weird. I poked my head out in the hall after some...measure of time...and it was dark. Wat. Let's do the time warp agaaaaaain. I made the circuit so many times, and I still feel like I missed a few things. I never managed to circle back around to a few brands...which kinda irks me still. And other brands had lines that were more than a half-hour long. Yeahno. That is not for me. The best part, for me, was meeting folks that I have "internet known" for a while. There were so many people that I just needed to hug. Makers, bloggers, random folks that just love polish...everyone was so friendly and open. It really was great. This was my second polish-related social event, and by far...it was the best one. I know...not much to compare it with...but it was a blast. It might have been because I had met a large portion of the folks before, that is guaranteed to put a person at ease. Tl;dr the vibe was amazing and I am looking forward to next year already. Hilariously, I went in with the idea of "Oh, I'm not going to buy much. Just a few things from new brands..." I'll wait while we all laugh. I burned through my carrying cash pretty quickly...and then tapped into my emergency account a wee bit. I ended up bringing home fifty six bottles of polish, including the VIP bag goodies. Don't ask me which is which...I don't know. I do know that sales are dangerous things for Nichole. I just want to say thank you to every SINGLE person who slaved away and made this so awesome. A lot of the bloggers who volunteered got nothing but thanks, and they deserve a ton more. So thanks, y'all. You're awesome...even if I didn't make it back to the tables. I made a slideshow of all the pictures I took at the con. It wasn't near as many as I wish I had taken...but it gives you an idea of the spread these brands laid out for us. Now, I know that I have waxed ecstatic about the Con here, but it wasn't without hiccups. 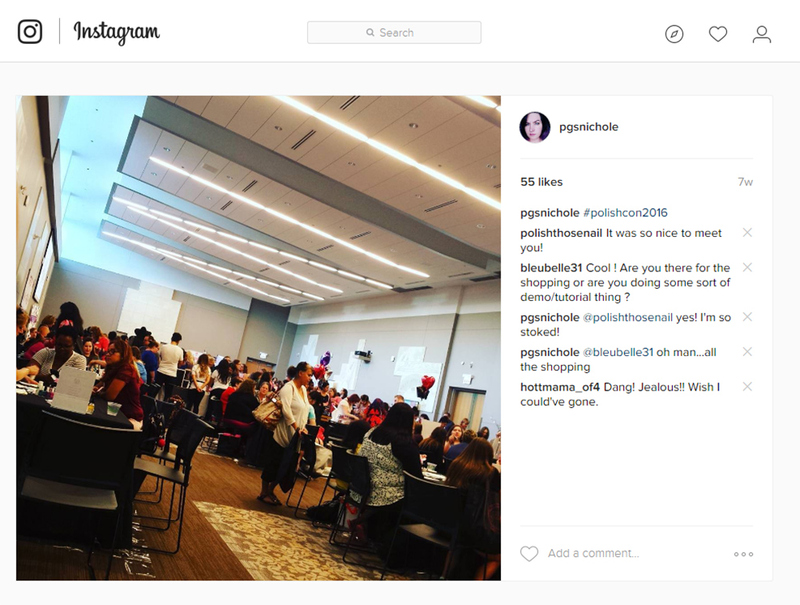 I do have some thoughts from a customers perspective that I am going to share because this is my blog and I said so. I had a VIP ticket, which entitled me to an extra hour of shopping. We weren't allowed in for nearly forty minutes, if memory serves. Everyone was queued up, getting disgruntled, and we saw makers going in and out...but no announcement was made. I would have liked to hear "Hey guys, we're running behind a bit. Sorry." A little communication would have been fab. Put all the VIP coupons in a single envelope, and not in each makers swag bag. I had to sit in the lobby area and unwrap every little burrito to check for coupons. Which for people like me who traveled long distances was a bit daunting. If the next venue has wall space above the vendors, have the vendors hang large photos of what they have. It could be seen from across the room, and it would have given those waiting in line something to look at. I hope they do all the drawings after the con next time. It was so hard to find all my tickets mid-transaction, and even harder still to get everyone to shut up so I could hear. All the tables were set up in a circle, so that the traffic would keep moving. There were also a few tables in the center, so that there was always something to see. It never felt boring nor empty. The food and drinks. OMFG. Even though it was Fall, it was still a LOT more humid and warm than I am used to. The water and light snacks in the back was just a godsend. Having the tutorial tables set up in almost their own world was just brilliant. It was nice to have a rest, watch people do marbling or stamping, and watch the people go by. There is another one coming to New York City in April. Check them out on Facebook to learn more. 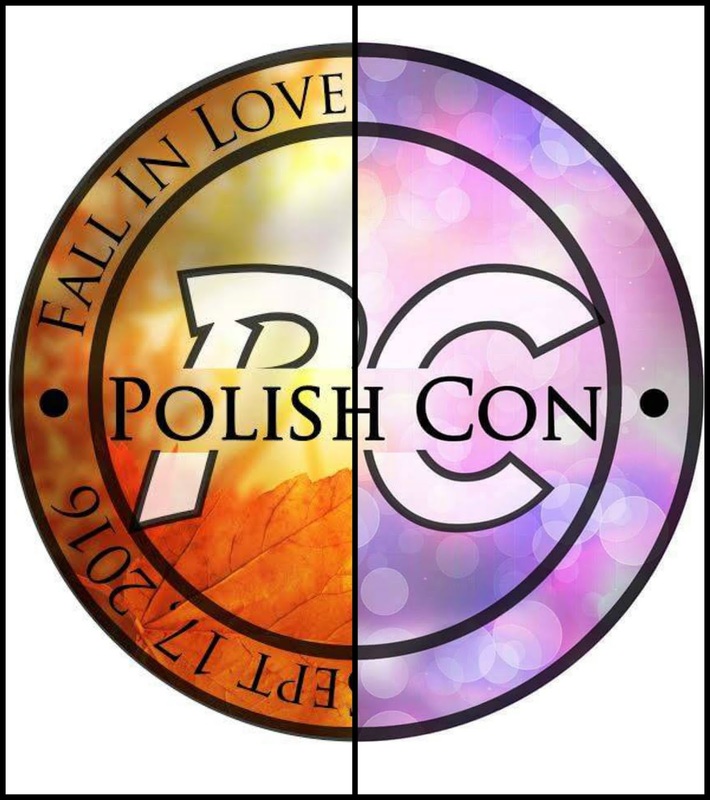 I wish I could go to NYC...but I am hoping for #PolishConSeattle2018. Who is with me? So jealous, I wish I could have gone. I don't like crowds either, so I think that's the #1 reason I didn't attend. 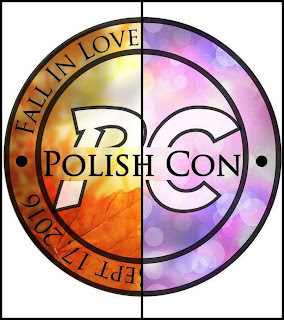 PolishCon Seattle sounds great to me! I'm glad I went to the inaugural event in Chicago, but the really packed crowded areas really set off my anxiety. I think this was a learning experience for everyone, and now they can be better prepared for what to expect for future events. That was one hell of a haul! I'm hoping to go to the NYC one. I went to Polish Con too and I had such a great time! Such a fun event! Looking forward to seeing your manis with the 56 newbies. Looks like so much fun. Someday, I'll get to go to one of these things! 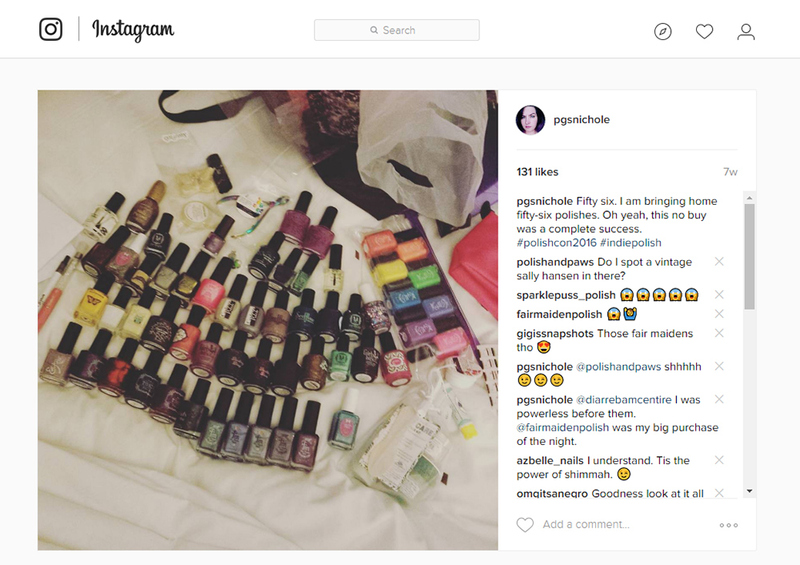 Lol 56 polishes! The life of a polish addict! Love it! LOVE!!! This was totally me after Indie Shop...I haven't counted my bottles (yet!). LOL Which brands did you never get to but wanted to? Great recap and I definitely vote for a Polish Con Seattle or dare I say it, Portland. We could use some love out here. Sounds like a great event. I really should have made the trip. Chicago is about 8 hours away by car, so this would have been my chance to go affordably. I'd love to make it to NYC in the spring but I doubt I will! I really want to go to one of these events one day! I am running, not walking to NYC for spring 2017 PC. Oh my dang, I'm envying you so much right now! I WANT TO GO TOOOOOO!!!!!! I've been so envious of everyone who got to attend. It would have been a few hours drive for me to get there but the event landed on my daughters birthday and while she loves nail polish already. Its not the kind of event she would appreciate spending her special day at. I love that you put together a overview of the event! Kind of bummed that I didn't think of that haha....but I totally agree with your points of what could have been differently. The event was fun, but a little overwhelming (especially for people who get anxious easily.) It was really nice to meet you though and I wish you were going to the NYC one! Oh I hate crowds as much as you do. I don't know if I could really make it! I really hope I can go to the NYC one. Your haul is amazing girl! Thank you for this, I am hoping to go to one of these in the future so it helps knowing what to expect!